Funny story about this scarf. The last time I wore it was in October, and I didn't really think about it again until the spring. It's a silk scarf, it seems totally reasonable that I would not notice it was missing for the five coldest months of the year. So last month I wanted to wear it again, but when I went to the drawer where I keep it I discovered it wasn't there. I tore my closet and subsequently the house apart searching for it, to no avail. I interrogated my Sister, my Mother, no one had seen it. I resigned to the idea that it was gone forever. A few days later as I was walking out to my car, a piece of fabric at the end of the driveway caught my eye. I walked over to the dirt covered material and could not believe my eyes. Some neighbors may have heard some very unbecoming expletives. There was the scarf. Though it looked like it had been run over, it was not ripped or damaged, just dirty. But how did it get there? My Mother thinks it must have been in my car the whole time and just coincidentally flew out the same week I was looking for it. But my car is very clean, and has even been vacuumed since last October; how could I have never noticed it hanging out in the back seat? I can't explain how it got there, but I'm very happy to have it back. Sheesh, what a story! At least you have it back, funny how that happened all at the same time, haha. Wow! So glad you found it! And it looks fabulous with this outfit! That is so weird that it was at the end of your driveway! I'm glad you found it though and it wasn't ruined! It's a good thing you found it. It's very nice! You're so lucky that it was only dirty. 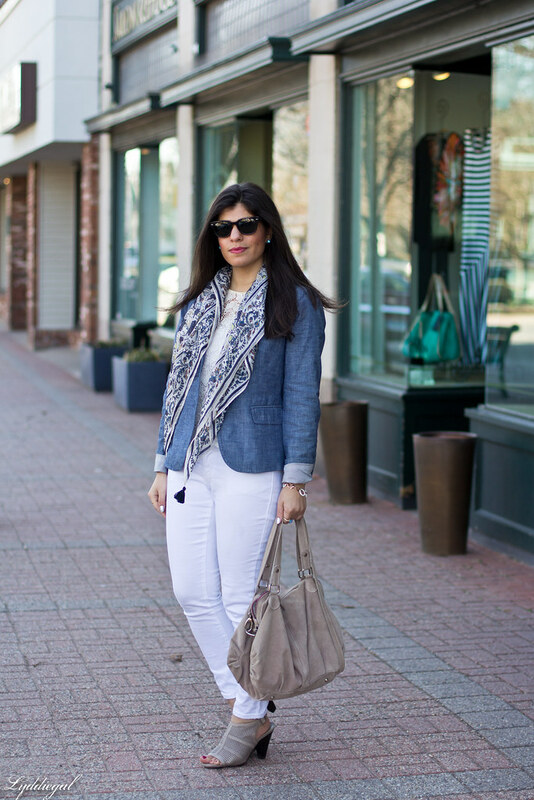 It is a very pretty scarf and it looks great with the white jeans and the chambray blazer. Something very similar happened to me once, with a necklace. I had worn it a lot, then forgotten it and, when I went to look for it again, found it missing. I tore everything apart, finally resigned myself to replacing it and... the next day is just appeared, right out in the open, as if it had been there all along. But I know I had walked past that spot so many times... I could go on, but since you just rediscovered your scarf, I know you know the feeling. It's a good thing it did turn up, though, because it is such a lovely piece. The tassle detailling on the ends is such a pretty and unexpected touch! I'm glad you found it! Clearly it was meant to be since you guys managed to meet up again after it so rudely disappeared! So weird, you must be so happy to have it back as it is super cute! Love the look. AWESOME outfit. Love the white with the grey/beige shoes and chambray blazer. Nice outfit, love your vest and this pants white, so pretty this scarf. Well I'm glad you found it, it's a very pretty scarf! That's weird how the scarf disappeared, but it did come home. You look Great in the all white + denim look and that lace top is so pretty. We totally ARE blazer twins today!! :) Love it! 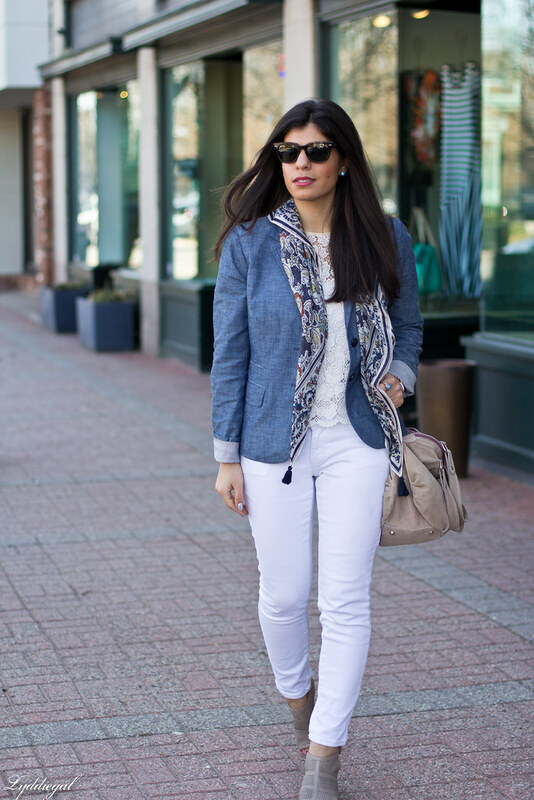 That scarf is gorgeous and I love how you styled the blazer with the white pants and beautiful lace shirt! How curious indeed! I'm glad you found it though! 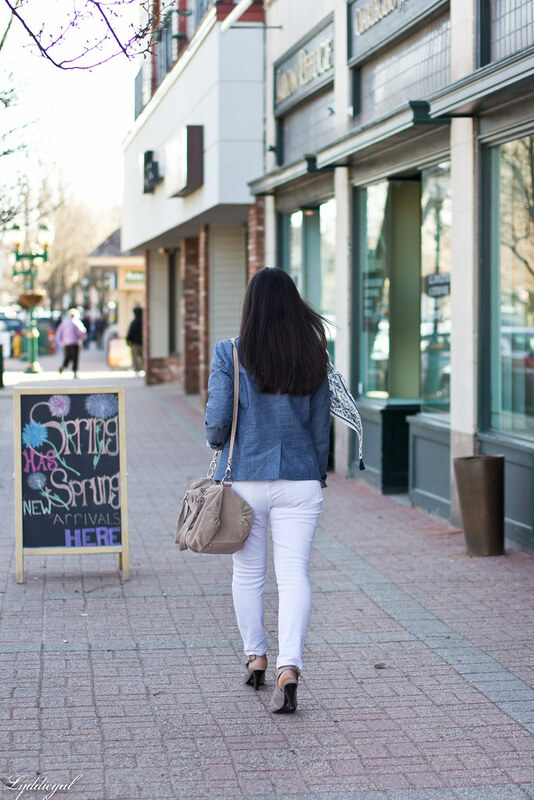 lovely a hint of chic and a hint of casual so you love it! I'm glad the scarf found it's way back to you! Also, I want to steal every bit of this outfit. 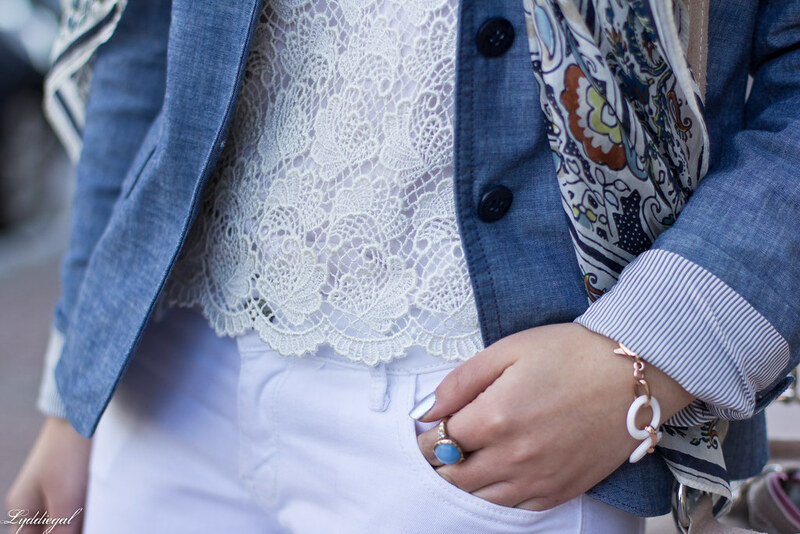 The denim blazer, the lace, the white jeans, the (lost and found) scarf...all of it...perfection!! Love this look hun, the blazer is beautiful!!!! I'm glad you found it because it is beautiful!!! super cute outfit! I invite you to visit my blog and let me know if you would like to support each other. What a cute scarf! Glad you found it. Sounds like of like something that would happen to me. I accuse my hubs of hiding my stuff all of the time, and then I find them in the most bizarre places! I love this blazer I need one similar. I think you should go back and interrogate your sister again, or the fluffy one: Chloe. I love this scarf - thank goodness you found it! HaHa Lydia! I'm glad you found it! What a story. I love the print and tassels on it. How funny, I am glad you found it because it totally make the outfit! Very Classic look! 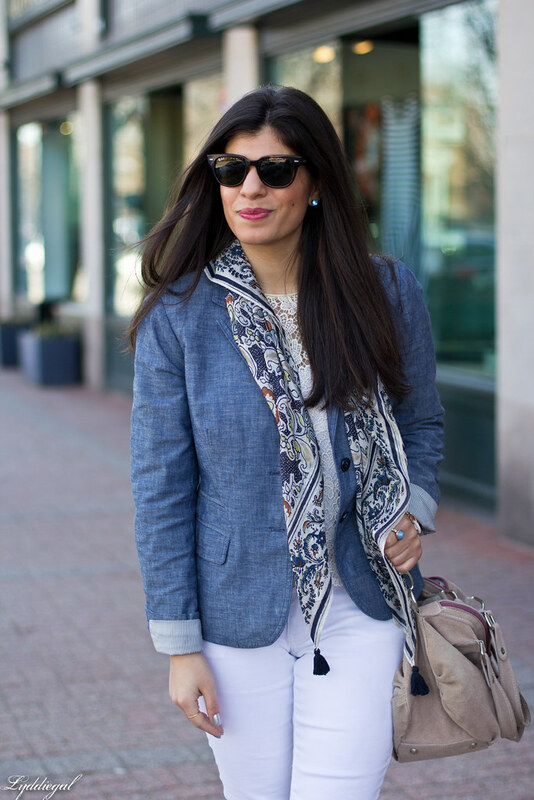 Love the chambray blazer! 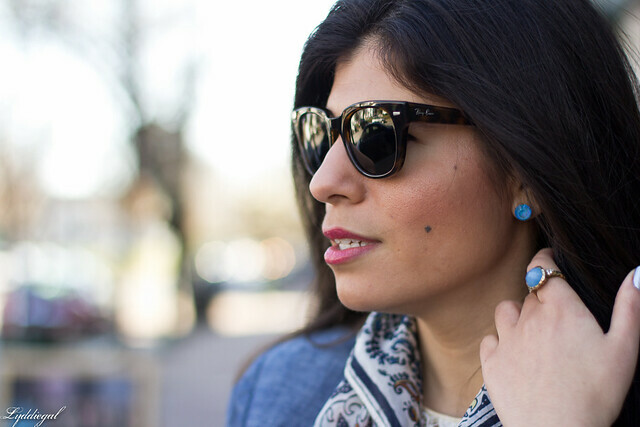 It's such a fun spring twist on a classic. That's crazy! I'm hoping the same thing happens to my social security card...haha. It's a cool scarf and I'm glad you found it! I'd wear this from head to toe, Lyddie! Fresh, chic, classy! Love it. 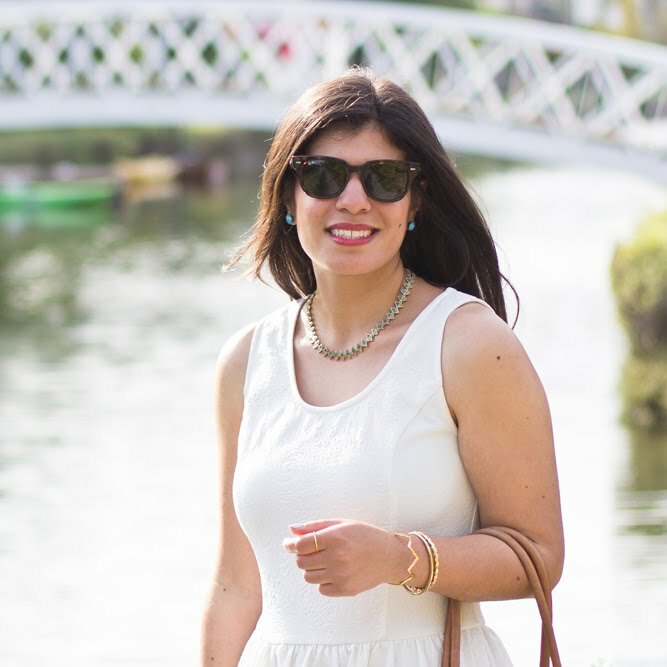 You make me want white jeans more than ever with this great post! Looking lovely! Great story about the scarf!! it is meant to stay with you obviously :) I love the white and denim look as well, very chic! !